This 1850 copy of a daguerreotype taken three years earlier displays Douglass’s impressive ability to visually communicate his strength, passion, and intensity. After the invention of the daguerreotype in 1839, photography became a democratizing force as greater numbers of men and women could afford to have their visage documented. 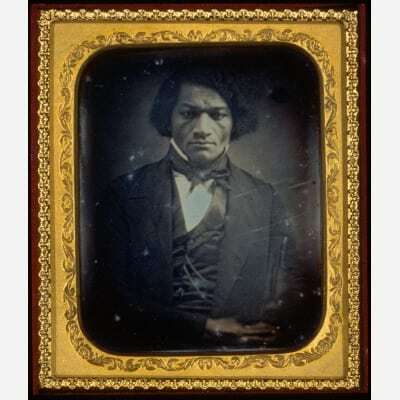 Douglass, along with Sojourner Truth and other African Americans, considered photography to be the best technique to capture the dignity and humanity of oppressed peoples. Photography, unlike painting, captured exactly the image that the sitter created, rather than privileging the image that the artist wished to create. As such, Douglass sat for numerous photography portraits over the course of his life, documenting the development of an abolitionist, women’s rights advocate, civil rights fighter, politician, and national figure.